Looking for a magician's table? Here at AmazeKids and Vanishing Inc., we have the world's most popular table for professional magicians, clowns, and variety entertainers. 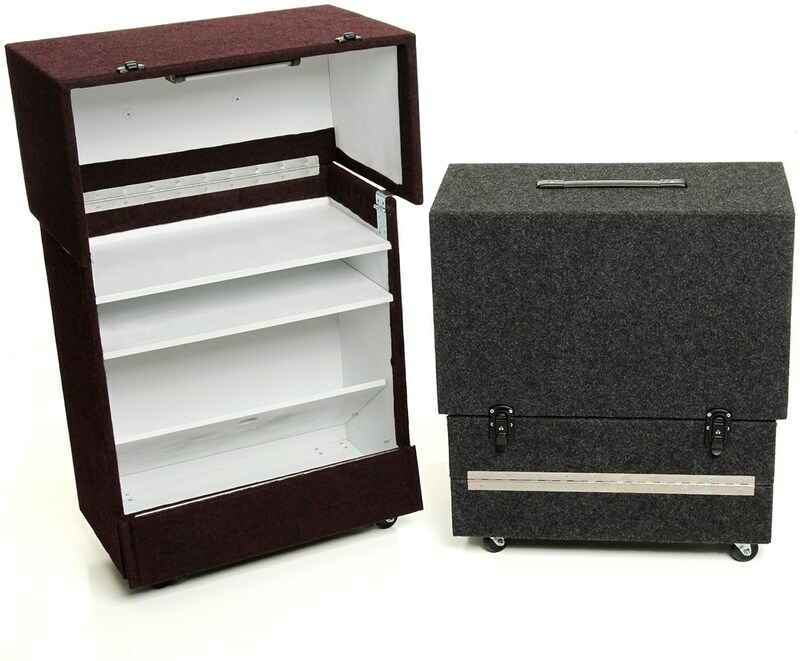 Our partner, Showtime Magic Productions makes the Joe Lefler Pro Suitcase Table. This high quality, precision-crafted table is based on Joe Lefler's original innovative design. It's an investment that will carry and protect your props for years to come while making you look your best when stepping in front of an audience -- whether in a living room, backyard, or corporate event. It's versatile design is perfected from over 25 years of real-world feedback from thousands of satisfied customers, one of whom is Danny Orleans, who counts on this table for his outdoor summertime family shows. High quality battery operated LED light mounted under the tabletop can be dimmed and aimed — a lifesaver for set up and tear down backstage or in poorly lighted venues. Bright white gloss painted interior offers ease of visibility when searching for props inside. It also wipes out easily with a damp cloth. Four 2 inch (5 cm) casters with quiet non-marring rubber feet. Rear flipper door for storing large props provides easy access to the table's generous storage capacity. Heavy duty piano hinges secure both the lid and the rear flipper door for years of service. Choose the right size for you at checkout: Large or Small. Because this is custom-made to your size and color specifications, expect delivery in six weeks in the U.S. When you receive it, you'll agree, it's worth the wait, because when you have the Joe Lefler Pro Suitcase Table you'll look like, perform like and feel like a pro. My review is 3/5. Here is the reason why you should or shouldn't buy it, and what to expect if you do. The table looks really good. It comes with a LED light that will help you find your props in a show with low lightning. It has 4 differentes compartments from which 2 can be adjusted at your convenience. The table is made out of plywood. This is said in the description of the item, but in case you don't know plywood is a fake wood meaning that won't last as much as you might think. Overpriced. However it's hard to find a fair priced table on the magic market. I am happy with the table, although at first I got upset for the extra work that I had to do, but in the long run I will get my money back by doing the shows.